Do the earliest mammals have lessons for sustainable societies? It may seem surprising, but a statement in a recent article in New Scientist about early mammals who lived before the dinosaurs went extinct, gave me an insight into the problems facing those of us trying to create sustainable societies today. The dinosaurs died 65 million years ago, in a great climate-change catastrophe possibly culminating in an asteroid strike on the earth. There were also 20 lineages of mammals back then, but none of them were from modern groups of mammals. The dinosaurs dominated global ecology, taking up all the major niches, leaving only marginal ways of living to the early mammals. 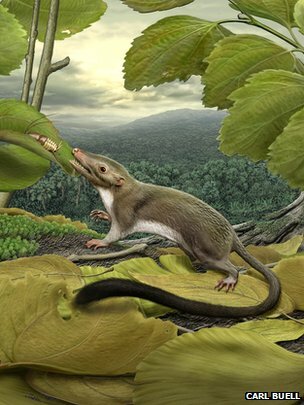 For example, being warm-blooded, they could hunt for insects at night when most dinosaurs were too sluggish: “a small insectivore that climbed trees and had a long tail.” The great expansion into the modern lineages (primates, rodents, etc.) only developed during the 2 or 3 million years after the dinosaurs died out. Now many of us who see the madnesses of our present societies are trying to build practical alternatives: local food systems, community transport, local currencies, permaculture, the Transition Towns movement, ecovillages, and so on. We imagine that the new social structures we are growing will form the basis of a future society that is co-operative, egalitarian and environmentally sound. We are very unclear about how what we are doing could become mainstream, but that doesn’t stop us. To ourselves and each other, we are clear about the importance of our projects and (hopefully) enjoy doing them. I know well from personal experience and from watching others how much difficulty the presence of the mainstream economy makes for our projects. The most die hard local food campaigners can sometimes be spotted in Tesco and admit that it provides a lot of their food. And food from our community farms isn’t cheaper than supermarket food, even with a lot of volunteer labour. How can community transport take off when most people have their own cars, and what about those committed environmentalists who claim good reasons for owning a 4 x 4? The most successful local currency systems seem to be those that are backed by conventional currency! I’m sure you can think of many examples. Does this mean we are mistaken to think we are developing better, sounder ways of living? That really, the competitive market, chasing money and consumption, is what people want and will always choose? I don’t think so, but here is where the lesson of the early mammals and dinosaurs comes in. I have been convinced for some time that our alternative sustainable vision will not take over simply because enough people come to see that it is needed or better. The defenses of the mainstream economy, especially in the realm of ideas, will see to that. The social and economic niches are not there. The change will come only when the conventional economy collapses. I say ‘when’ not if, because I think that even if it doesn’t collapse in the short term through its own instability, (which is most likely) eventually it must collapse through the effects of extreme weather, resource shortages (especially peak oil) and environmental degradation. The lesson of the New Scientist article is that the social forms we are developing now are not those that will become mainstream after the crash. Moreover, they don’t need to be, but they do need to point the way, to contain the seeds of what will become mainstream. What we are doing now needs to be pre-adaptive, to enable us to survive a crash of the money system. For the mammals, warm-bloodedness was probably the key to their survival, but maybe it was just chance. Many cold blooded creatures survived too. The key feature for our sustainable efforts is that our projects are co-operative, not competitive, and give us the social and emotional support we need to get through the change. We are pooling our resources, and that can enable us to survive with much less money when the crunch hits. The fully fledged sustainable social structures can only really develop once the market economy – where the driving force for production is to make money – can be replaced by a collaborative economy where the driving force is to serve the well-being of people and planet. In an overpopulated, resource-short world, we will then be able to create efficient ways of providing lives for everyone that are modestly comfortable in material terms, but opulent in social and cultural terms. 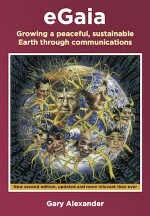 I spell out this future vision in my book eGaia, Growing a peaceful, susainable Earth through communications, both in its social and practical dimensions. In the forthcoming second edition, the change will take place explicitly after a crash in the money system. Charles Eisenstein, Dave Pollard, Rob Hopkins and all my Transition friends are pointing towards the same vision. A friend phoned me up a couple of days ago to say that the Cyprus bailout was actually going to be the start of the big crash. I suppose that could be true. Of course, the mammals might not have survived the extinction event, and we can’t be sure our vision will either. We may know soon! 1 Response to Do the earliest mammals have lessons for sustainable societies? Nice one Gary, a post that speaks personally to me about the effectiveness of the various lifestyle choices I’ve been working on these past few years (in particular plans for a group of local people to build together a communal, low-impact homestead). Glad to see your blog in place & be sure to tweet new posts as they arise.